Similar to our windows, your imagination is a work of art. If you have recently had some inspiration for creating a gorgeous window or lamp, all you have to do is bring us your idea. We can take your design and help create your perfect stained glass piece using the colors and shapes you choose. Our specialists will work with you to make sure that we produce your perfect stained glass application. McCully Art Glass & Restorations is happy to turn your dream into a reality. Losing your business, church or home can be utterly devastating. It’s equally as devastating to lose your stained glass during a building renovation. However, we can salvage the pieces to repurpose them. We can either salvage them to sell them or reuse them in new ways to your fancy. Our professional stained glass studio can help ensure that you never lose your favorite stained glass pieces ever again. Sandblasting is another reason McCully Art Glass & Restorations is the top stained glass company in Indiana. In order to sandblast something, a high-velocity abrasive is used to create clean or etched surfaces on any glass or metal that you can dream of. We can take your boring and dull appliances and sandblast them to make them beautiful and unique. Glass etching can add that “WOW” factor to any current decorations that you have. Finally, we are the top stained glass company in Indiana because we can repair your precious stained glass. Choosing to light your building with stained glass lamps can show that you have elegant taste. However, what do you do when a lamp meets a wild arm, a rogue purse or an enthusiastic dog? Next thing you know, your hopes and dreams are smashed along with your lamp. Don’t worry because McCully Art Glass & Restorations is here to save the day. We can take your busted lampshade and repair it to its original status. You will not believe that your niece or nephew knocked it over while playing tag. 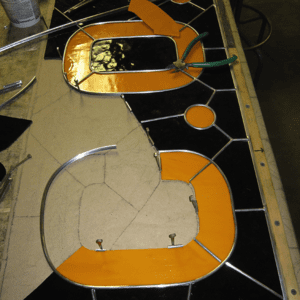 Not only can McCully Art Glass & Restorations in Lafayette, Indiana create your perfect stained glass applications from your mind, but we can also repair your treasured windows and lamps to their esteemed honor.